The Sri Lankan new year in April is a time when people desert Colombo in droves and head to their home town. Since a large part of Colombo's population have their root elsewhere that means the city is practically deserted. Even the Colombo born and bred decide to abandon the city in favour of the cooler climes of Nuwara Eliya. So it's no surprise that during the new year weekend it reportedly took upto 11 hours to reach the Nuwara Eliya from Colombo. Many of the holiday makers travelled via the Peradeniya road since the Avissawella Nuwara Eliya road is still under construction. And thus they had to fight every inch of the way with a large number of residents of Kandy returning to their homes along the same route. Took us 11 hours to get to Nuwara Eliya from Rathmalana! Of course with a couple stops, but mainly standstill traffic! One of the worst trouble spots turned out to be Warakapola. Even if you managed to squeeze past, there was plenty of Traffic at Kadugannawa and then at Pilimathalawa to keep you on your toes. A heavy police presence, mostly to nab people who exceeded the speed limit didn't make matters any better. For that meant it wasn't possible to overtake even when the road was clear. Towards the end of the month, schools reopened, the prodigals returned and the weather changed. It lead to some spectacular traffic jams like these. This pattern is clearly seen in the charts which shows a flat region during the holidays with higher numbers on either side. 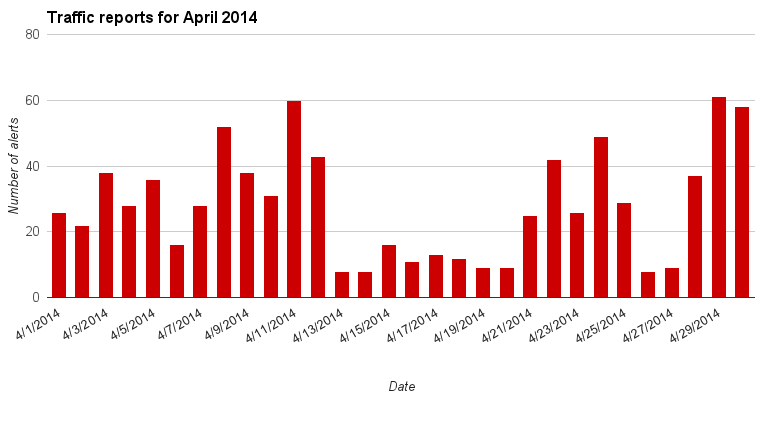 The average number of traffic reports published for the month (mean) worked out to 28.3 while it was 33.2 for March. Update April 08, 2015: Now we have a simple solution to the new year traffic problem!